In 2010, the IwB partnered with Lota, a small municipality in Chile. Lota faces numerous environmental issues, including a drastic shortage of housing after a major earthquake in 2010 as well as severe economic depression. Yo Soy Lota, “I am Lota”, is a revitalization plan conducted by the IwB that proposes design solutions for Lota’s challenges based on empowering the local community. Yo Soy Lota! People change places. To propose design solutions for Lota’s environmental and economic issues. In particular, to propose viable solutions for Lota’s housing shortage, moving residents from temporary, post-disaster zone shelters, to permanent low-cost housing that utilizes Chilean government subsidies. Community charrette in Lota, Chile. 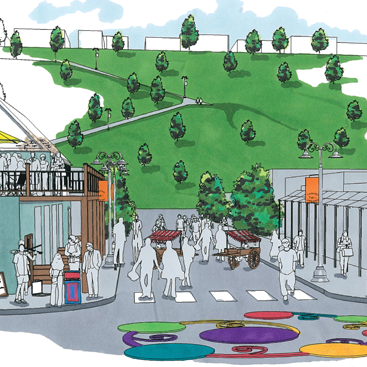 A rendering depicting the proposal for the market area as part of the revitalization plan for Lota. People Change Places, the year-end student exhibit at the School of Design's gallery. In year two of City Systems, the IwB began a major project in Lota, a small municipality in Chile, which was brought to the IwB’s attention by the Latin American Canadian Art Projects (LACAP). LACAP, a Toronto arts organization, partnered with Lota after the February 2010 earthquake. Lota’s built environment has been shaped by its relationship with its natural environment: by its coast, forests and hills. The 2010 earthquake crippled the town, one third of Lota’s population was left homeless. In the months following the earthquake, housing needs became the town’s priority as approximately 10,000 Lotinos were housed in temporary shelters. In addition to environmental disaster and insufficient housing, Lota has a host of other problems: economic collapse primarily caused by the loss of its mining industry, environmental degradation caused by unmonitored mining practices, limited connectivity to other areas of Chile, as well as the general neglect of infrastructure and public spaces. Lota is a poverty stricken city, afflicted by economic decline and a lack of appropriate structures to deal with natural disaster relief and reconstruction. In the fall of 2010, IwB students and staff travelled to Lota to conduct field research. In Lota, the IwB students and staff worked with locals to gather data on the town’s most urgent issues. Towards this goal, the IwB also organized the Lota Community Charrette. Yo Soy Lota–”I am Lota” is a slogan and a graphic identity that emerged from the Community Charrette. 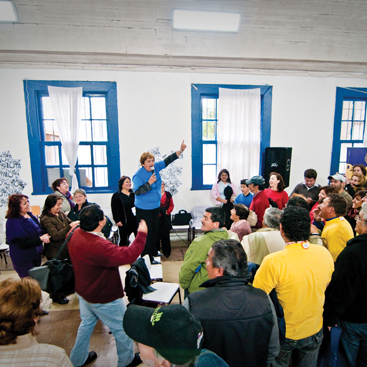 The Community Charrette and the subsequent adoption of the phrase Yo Soy Lota by Lotinos conveyed their ownership of the community’s revitalization, and underlined that the participation of all citizens of Lota was required for any plan of action to be realized. It also reflects the community’s pride and the citizens’ commitment to their city. The IwB found that Lota’s most important asset is its human capital. Lotinos are hard-working predominantly skilled labourers that work with the abundant natural resources–fish, lumber and coal. With the ethnographic research and charrette results, the IwB completed a revitalization plan for Lota titled “People Change Places.” The report responds to planning and design challenges outlined by the elected municipal government of Lota, and it is based on citizens’ recommendations. The report has six strategic objectives: community empowerment, increased mobility, public space enhancement, housing innovation, institutional restoration, and economic prosperity. It proposes an urban beautification program based on public space enhancement and interventions to improve and showcase Lota’s environment, including restoring continuous paths along both natural and urban rings, proposing wayfinding systems, and cleaning and protecting Lota’s coastline. It emphasizes a new city identity based on community empowerment through strategies like a new business improvement area and a sports leadership program. Lota’s need for housing became a particular focus of the IwB’s research and revitalization proposal. Lota needed housing that could make use of government subsidies, respond to regional growth, and be flexible to the city’s unique urban setting and natural environment. The IwB outlined different housing typologies that meet post-disaster and social needs of the region, including ‘valle verde,’ an expandable, permanent social housing solution that adjusts to the flat terrain, ‘casa feria,’ a multi-storey live-work unit that promotes new residential development within the downtown core while providing new space for market stalls. People Change Places outlines many other viable projects for Lota’s development. Importantly, it stresses Lota will change when all citizens contribute to its change. Lotinos are Lota! People Change Places is a design strategy rooted in immediate, collective, and local action. The residents of Lota were perpetually ‘waiting’ for help, but systemic change cannot wait for external motivation. It has to come from within. A place will change when everyone contributes. Working in South America and seeing the energy and determination of the local community was an extremely rewarding experience for the IwB. Students and faculty of the IwB, extended their experience in the realm of inter-cultural, politically charged projects and the limits and strengths of participation from design groups from abroad. Further, taking on the Lota project the IwB was able to examine the complete system of a small city and approach it through whole systems design and social innovation. During the project the IwB developed the City Systems Matrix that outlines the values and characteristics of a resilient city. The matrix is a tool for understanding how global trends affect local contexts and highlights that places like Lota, a city recovering from natural and economic disaster, can offer many lessons for other cities around the world. In October 2010, the IwB students, staff and faculty travelled to Chile for a 10-day research trip. Landing in Santiago and proceeding to the city of Conception, the Institute’s students met with students from Duoc UC and participated in a short charrette at the university. This first charrette in Chile was a way for the Institute’s students to do research and planning for their work in Lota. Next the Institute’s students, staff and faculty travelled to Lota, where they met the local community. The students ran a the City Design Charrette with residents of Lota and the Chilean students from DUOC UC, continuing the research they started in Conception. Throughout their stay in Lota, the students did extensive ethnographic research and participated in the towns events, even participating in a local radio interview. The City Design charrette and the students’ time in Lota were a crucial time during which the Institute was able to really grasp the issues that are key to reshaping Lota’s future. The IwB student’s first academic charrette that looked at designing post-disaster solutions for housing, healthcare and other community needs for the earthquake-ravaged City of Lota. This charrette was based on the students’ research findings from their trip to Lota. The earthquake of 2010, left the residents of Lota in need of temporary housing. Thus, the charrette became focused around making a kit of housing parts that could easily be transported to Lota. The charrette proposals revolved around shipping housing parts or using a container as a pop up shop; design solutions had to be easily shipped in containers and address the community’s different post-disaster relief needs. The IwB students created a series of installations and events at the School of Design that told the story of the Lota revitalization project using the theme of ‘Imaginando Lota’ (Imagine Lota). The installations included a catalogue that discussed the students’ findings. For the 2011 Toronto Interior Design Show, the IwB students designed and built an interactive exhibit showcasing their work with the City of Lota. View the IDS Student Booths project page for more info. The Toronto Charrette is an annual IwB event that brings together 200 plus students, faculty, and industry experts from organizations around the world. In 2011, the theme of the charrette was sustainable tourism in Lota, Chile. Charrette participants were asked to design new tourist attractions for Lota as a means to revitalize the town’s economy. Students from Duoc UC came from Conception to join in the charrette. For their year-end exhibition, the IwB students launched the People Change Places Book, built an exhibit and made a video about the design details of the revitalization project for Lota. 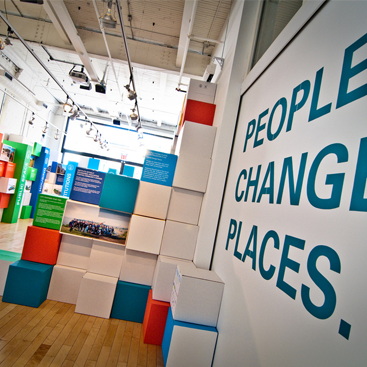 The exhibit was modular and made out of a series of boxes in different colours, representing the six themes from the People Change Places book. It stressed the diversity of solution that the students had created with Lota residents to spark the economy and attract investors in the the town. Most importantly, the exhibition stressed the central point of the students research and design work that for a place to change the people have to be motivate to enact change themselves. The website allows users to journey through the IwB’s project proposals for Lota via a mapping function. Both the book and the website showcase the students’ proposals, which are based on 6 strategic objectives: Housing and leadership, public space enhancement, increased mobility, housing innovation, institutional restoration, and economic prosperity.